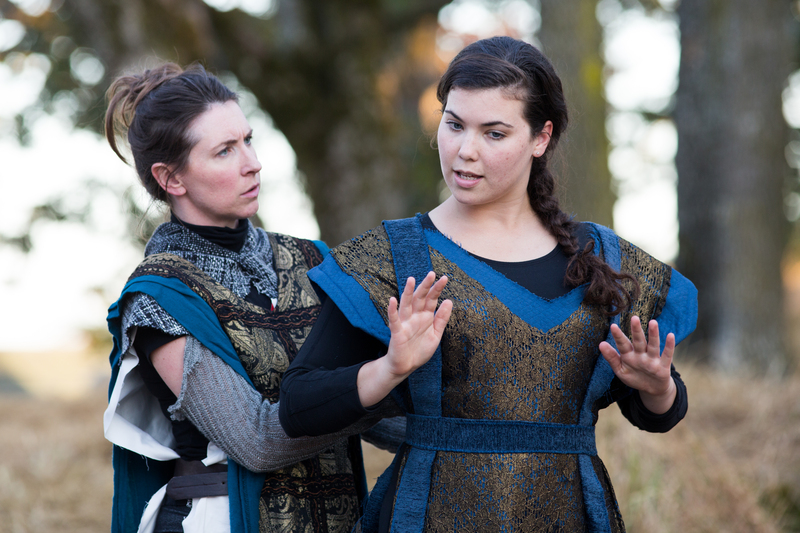 You are here: Home / Arts / Greater Victoria Shakespeare Festival 2014. Henry V a review. I love summer! 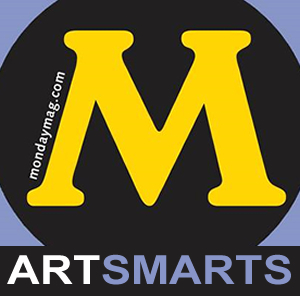 It offers myriad opportunities to spend time outdoors, enjoying concerts, movies, and performances of dance and theatre. 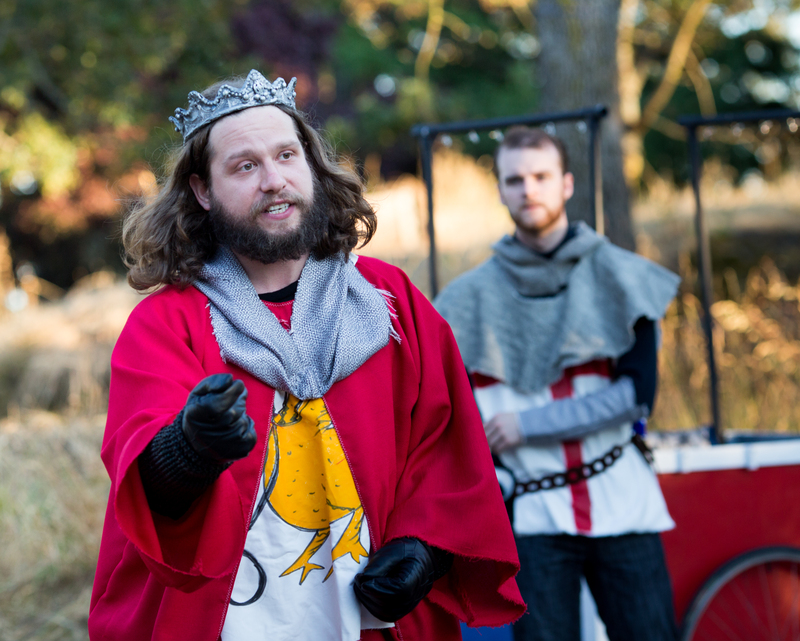 I particularly enjoy spending warm summer nights on the lawns of Camosun College for the Greater Victoria Shakespeare Festival (produced by the Victoria Shakespeare Society). There is truly something magical about being gathered together in community, sharing picnics or pre-ordered suppers, while the players entertain the crowd. 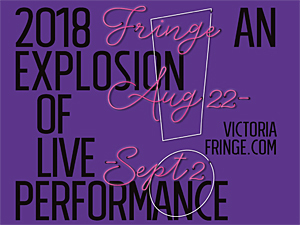 The present season (the 24th) is one of transition—long-time Artistic Director Michael Glover has passed the reins to Karen Lee Pickett, who is also the Festival Producer. The society has made some conscious strategic and artistic decisions that, to my mind, are already bearing significant fruit. 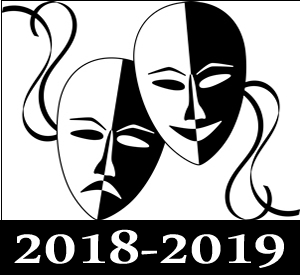 The first decision (as outlined in my interview with Ms Pickett) was to use the repertory model for this season’s shows (Henry V and The Taming of the Shrew); all the actors (with some minor exceptions) are in both productions, which are directed by Clayton Jevne. A kingdom torn by civil strife. A young English king. A rash decision. When Henry V rallies his army to enforce his claim to France, he finds himself surrounded by ruthless acts of moral ambiguity, and comes up against the ultimate test of leadership on his journey to becoming a legendary king. 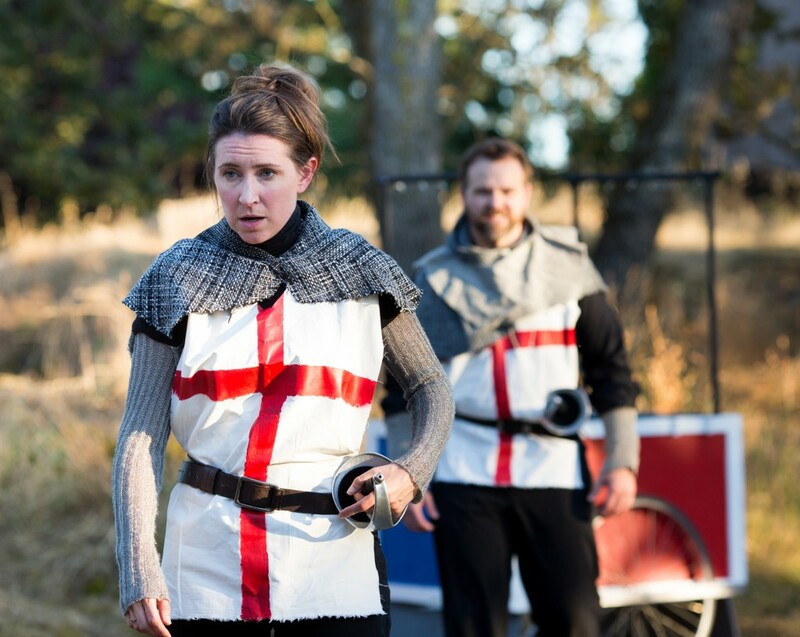 From the moment the players wheel their carts onto the Camas stage (a new innovation in 2013) in Henry V, one is immediately struck by the strength of their presence as an ensemble. Clad all in black, they declaim the opening lines in a frank, forceful and authoritative manner—the audience is enjoined to sit up and pay attention; our participation is vital in re-creating all manner of action across two countries, in particular the battle scenes. Costume designer Kat Jeffery employs simplified costumes, building on basic black, with the addition of emblazoned surcoats differentiating the English and French troops. Henry (Julian Cervello) is most appropriately outfitted in red, while the French royalty appear in blue. The clergy also have elaborate robes, vestments and head pieces. The carts serve as portable wardrobes, and the characters dress onstage. The textiles, particularly for the lower classes, are often rough. Additional elements included gauntlets, tunics, cowls and cloaks. Taken together, the effect was most pleasing. The company is comprised of 12 actors (6 men and 6 women), two understudies and two Junior Company members. 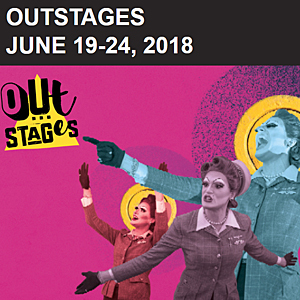 Given the paucity of roles for women in Shakespeare, there is much gender-bending in Henry V and The Taming of the Shrew (as well as actors playing multiple roles). Since I am not that well acquainted with either play, and am not a Shakespeare aficionado or scholar, I found it helpful to have the program at hand to sort out who was who. The actors themselves through costume, voice, accent and physiognomy differentiated the many characters with aplomb. 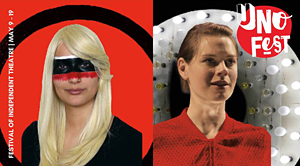 One of the festival’s other significant decisions was to employ two mentor actors (Julian Cervello and Adrienne Smook) in order to provide active leadership to the ensemble through teaching workshops and techniques. This is most evident in the beautiful pacing of the language, the clarity of the exposition, the unique accents and the power of the projection. Performing Shakespeare outdoors always comes with challenges—it’s one thing to perform in a theatre, and quite another to compete with bus traffic on the edge of the campus. Cervello worked on the fight choreography which retains a stark realism given the close quarters of the stage. I remarked in particular scenes with Nym (Nicola Whitney-Griffiths) Bardolph (Ursina Luther) and Pistol (Susie Mullen) (Act 2 scene 1) where the bad blood between the latter two threatens to erupt into a sword fight, and with Fluellen (Adrienne Smook), Gower (Justin Guthrie), Macmorris (Alex Judd) and Jamy (Adam Holroyd) as they debate the art of war before the gates of Harfleur (Act 3, Scene 2). There is an authenticity to the swagger and ceremony of war that is heart-rending given the outcome of the battle. Junior Company member Amy Danks plays attendants and messengers with ease—her young age underlying the tragedy settled upon the luggage boys (Act 4 Scene 7). Comic relief is provided in the delightful scene between French princess Katharine (Alexa MacDougall) and her attendant Alice (Adrienne Smook) as the princess, destined to be given in marriage to settle the enmity between the nations, tries to learn the English words for hand, fingers (and so on). Shakespeare sprinkles French throughout this play—at times this amuses (as above) and at others, it serves to highlight the mis-communication between peoples. Jevne has chosen to give the French characters accents, as surely they would have had in Shakespeare’s time. Throughout, the King—Charles the Sixth (Claude von Ebertz)—the Dauphin (Ursina Luther), the Constable and Montjoy (Nicola Whitney-Griffiths) retain great dignity—despite being portrayed with a clear anti-French bias. Smook’s work as dialects coach is apparent throughout. Cervello’s Henry V is powerfully contained—having conquered the more licentious aspects of his misspent youth—building to an outpouring of fervour in the St Crispian’s Day monologue. It’s easy to see, with his assuredness, how men would follow and obey. And yet, his tenderness as he woos Katharine definitely melted my heart. Jevne has trimmed the text judiciously—Henry V brims with taut tension, passionate soliloquies, tender moments and comic interludes in this cautious reminder of the perils of war and sword-thumping. The horror and the pageantry are equally aligned. Disclaimer: I was provided with a complimentary ticket to Henry V. As always, I retain full editorial control over all content published on this website.